When the editors of Harvard Business Review open their vault of leadership and management gems, scouring its vast depth for the best and brightest of their treasures, and then line them up for you to glimpse and grasp -- get in line! Whether you look at HBR's 10 Must Reads On Leadership as an essential leadership primer or approach it as a graduate course sandwiched between two covers, this book is outstanding. HBR's 10 Must Reads On Leadership is a gathering of some of the best thought leaders from yesterday and today. How often are you going to find Peter Drucker, Warren Bennis, John Kotter, Daniel Goleman, Jim Collins -- along with Bill George, Ron Heifetz, Diana Mayer, Deborah Ancona and others -- all waiting to share insights and impart wisdom? 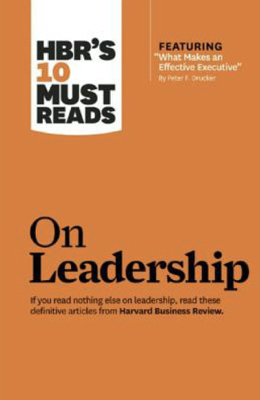 When you read HBR's 10 Must Reads On Leadership you don't have to dig through past issues of Harvard Business Review to glean from the great. It's all right at your fingertips. It's theory and practice, insight and impact! 1. The line-up: I've already mentioned many of the authors. Here are a few of the titles: "What Makes A Leader?" "Why Should Anyone Be Led By You?" "Crucibles of Leadership" and "In Praise of the Incomplete Leader." 2. The research: HBR leans toward research-driven content. Many of these works are reports of multiple-year studies. 3. The approach: If you are not familiar with the HBR approach, it is a beautiful blend of theory and practice. Their works are designed for the reflective practitioner intent on practical results-oriented application. 4. The perspective: Collectively, HBR's 10 Must Reads On Leadershipprovides a global perspective on leadership. This is not simply what's happening on the American scene. 5. The attention to detail: The indexing and contributor bios are outstanding. HBR's 10 Must Reads On Leadership is just that. Read it. Apply it. You won't regret it.